Among the many home cardio equipment, the best compact rowing machine offers a combination of a small footprint alongside a full body workout. Because you’re using your entire body they also burn a lot of calories and are comparable to exercise bikes and treadmills in that department as long as you keep up the intensity. Why Buy a Compact Rowing Machine? The most common reason to buy a small rowing machine is because you don’t have a lot of free space to put it at home. This is the case for many small homes, apartments and condominium units. When space is tight, rowing machines with small footprints allow you to get your workout in without hogging a lot of floor area at home. Other reasons to get a compact rowing machine is because you don’t want a huge piece of exercise equipment taking up a lot of space in your living room or play room. In many cases we like just leaving the workout equipment out so there’s no need to store it and pull it out when we’re about to exercise. But, when it’s not being used, a big, bulky rowing machine can make disrupt the interior design of your home. Finally, a compact rower is also easier to store away. They’re lighter and often foldable. This makes them easy to slide under the bed or push into the storage room. Doing so keeps them out of sight when visitors are around. When choosing a good small rowing machine you’ll want to consider the physical shape of the equipment. The reason being that indoor rowers come in different designs and this dictates the dimensions of the unit. Rectangular in shape: These are often between 40+” to 50+” in length and between 23” to 28” wide. They are more rectangular in shape because they come with rowing oars (arms) on the sides, with one oar for each your hands. These rowers are the least expensive ones and often cost $250 and below. They are powered by a single or dual hydraulic pistons, depending on the model. The pistons are what provide resistance. Long and slim: Those who are more serious about rowing or want an experience closer to being on the water often prefer this rowing machine design. These are very long, with the short ones around 70” long and the higher end units reaching close to 100 inches long. They are as long as they are thin. Most measure anywhere between 18 inches wide to 25 inches. These are the units used by elite rowers and those who are serious about their rowing. They offer a longer sliding rail for full leg extension. As such, these units are often more expensive. So the fit of the machine may depend on your preference as well as that free floor area you have in your home. For some compact is in the shape of a rectangle, for others, it’s a slim, but longer area. When it comes to choosing your rowing machine, here are a few factors to consider. Hydraulic rowing machines. These are the often the smallest, lightest and cheapest options. They use the resistance from hydraulic pistons to make it hard to pull the oars. Many hydraulic rowing machines are also foldable. This gives them the extra advantage of being easily stored away. Their downside is they don’t simulate the rowing experience as well as the other types of rowers do. Air rowers. Air rowing machines are fitted with a flywheel which causes wind resistance. As a result, the harder and faster you row, the higher the intensity of your workout. Air rowers offer very smooth rowing motions and mimic being in the water very well. Air rowing machines are good compact options because they have a narrow design, though higher end models are longer. Magnetic rowers. Magnetic rowing machines are a step over air rowers. They use a similar principle. But, use electromagnets instead of air as resistance. So, you get a smooth rowing movement. While expensive, they are the quietest rowing machines around. The good news is, they allow you to specifically adjust the level of resistance. So, you can tailor your intensity. Water rowers. Water rowing machines are as close as you get to rowing in the river without getting in the water. They are fitted with a water tank so you experience the same resistance and splashing as you would in a lake or river. Here, the handles you pull on are connected to paddles that push against the water. As a result, you get the exact feel of being in the water. Water rowing machines are big and expensive. 2. How Much Free Space Do You Have? We discussed space a bit above. So when it comes to buying your rowing machine, you need to decide the dimensions of your rowing machine that can fit into the space you have at home. In general, hydraulic rowing machines are the smallest options. They are also foldable which helps when storing away. While they are the shortest in dimension, they’re a bit wider than many air and magnetic rowing machines. This is because they need to fit the hydraulic oars to the sides. Air rowers and magnetic rowing machine are often long and slim. They aren’t as short as hydraulic units. But, because their handle is attached by a single cable in the middle it takes up less space to the sides than hydraulic units. When it comes to rowing machines, many of the features are either in the rower or the monitor/computer. In general, you want a heavy rowing machine. This gives you stability and durability. However, this is often the opposite of the specifications you’re trying to find with compact units. In addition, make sure that the rower can take your weight. Many have a minimum of 250 pounds. The higher end, more expensive units often offer maximum capacity of 300 pounds or over. That’s because master rowers are big guys, often at least 6’3” and upwards of 230 pounds. Rowing machines can pretty much be categorized into 3 budget levels. Cheap rowing machines cost under $300. Mid-range rowing machines often cost between $300 and $700. High end (expensive) rowing machines are priced at $700 to as high as over $2000. Most compact rowers fall under the cheap to mid-range. Seldom will you find small rowing machines that cost over $600. Here, it’s all about your budget and what you need out of your rower. The more expensive the unit, the more features and often higher quality build. Best Value for Money Rowing Machine: While it may not be the most compact in terms of length, its slim body allows you fit it into tight places. This rowing machine measures 77” in length, but is only 18” in width. It can likewise be folded up for that the rail becomes vertical. This saves you the extra space when it’s not being used. When folded, the device shrinks to a more manageable 48 inches long, 18 inches wide and 28 inches tall. This rowing machine runs on air resistance which is the same type of mechanism used in the Concept2 indoor rowers that are used by elite rowing crews and boathouses. We like it because it offers the best value for money. And while it isn’t as cheap as the hydraulic piston based units it also gives you a better workout, not to mention smoother rowing strokes. It has a sturdy build and the seat slides smoothly back and forth on the rail. The unit also comes with a digital monitor that displays the number of calories burned, distance rowed, time of your current workout and the speed at which you’re rowing. Something that’s much shorter in length that will still give you a good cardio workout is this compact rowing machine. It measures 59 inches in length, is 29 inches wide and goes up to 21.25 inches high. This is a shorter but wider unit at is it more rectangular in shape. The unit is designed for users who weigh 220 lbs. or less. It also offers 12 different levels of resistance you can adjust between, and is fitted with a basic digital monitor to track your workouts real-time. This home rowing machine uses hydraulic piston resistance that’s located under the unit. The arms attached to the hydraulic piston which makes it provide resistance. The device also features full motion arms. The motion of this unit is more akin to rowing on a rowboat where you have a wider circular motion. This in comparison to the air resistance rowers which have a motion more similar to like rowing in a shell. Simple to assemble, quiet during operation and affordable, this is a good small rowing machine that will help you get your heart rate up. 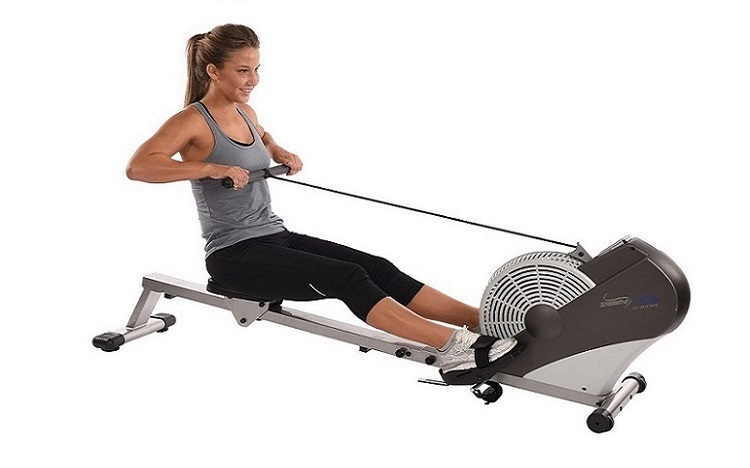 Cheap Compact Rowing Machine: As far as price is concerned, this unit is very affordable. This makes it something that you can get to exercise at home even if you’re on a budget. This is a slim, lightweight unit that’s also very compact. It is shorter than both the rowing machine reviews above so far. It has a very minimalist design where the hydraulic piston is located on the top side of the rail. Most hydraulic rowing machines often position the single piston underneath the user. This design does let you feel the direct pressure of the hydraulic resistance so you should get an effective workout. You can also switch between 5 different levels of difficulty depending on the type of workout you’ll be doing. This lets you set it to low and do fast intervals or raise the resistance to high for more muscle training. Long and slim, this may be what you’re looking for in a compact rowing machine if you want to be able to get a more realistic feel of the sport. This is a step above the others including the Air Rower above, and offers more leg room that makes it closer to like being in on a shell. To offer that extra leg extension, it is longer than all of the other indoor rowers in our review. Overall, it measures 90” long, is 18.5 inches wide and 23 inches tall. It does fold up for storage where the rail bends vertically. When folded, its dimensions are 34 inches long by 19 inches wide and 64 inches high. The RW1000 uses a 16.5 lb. flywheel and a eddy current drive system. Together they allow for a much smoother rowing stroke that’s also very quiet. This mechanism along the the longer sliding rail makes it a cheaper, solid alternative to the more expensive Concept2 rowing machines as it gives you a feel that’s closer to being on the water. It is equipped with a 5 level resistance adjustment knob and is rated for maximum weight capacity of 300 lbs. Ultra Compact Rowing Machine; Small footprint: Should size be your main concern, this rowing machine offers the smallest footprint of all the compact rowing machine reviews we have here at 46 inches long and 23.5 inches wide. When you’re done with your workout, you can turn it vertically so it takes up even less space. Both the rowing arms fold inward to reduce its width. When folded it uses up a floor area of 11.75 inches by 9.5 inches and it 49.5 inches tall. This indoor rower uses a single gas shock as resistance. It also gives you the option to increase or decrease the level of resistance. Built with a steel frame construction it uses a wide rail that allows the seat to slide forward and backward smoothly without wobbling even during intense workouts. This home workout equipment does require a bit of setting up through the instructions guide you through each step with directions and images of the different parts to put together. The manual also includes a target heart rate chart and warm up exercises you can use as guides for your cardio program.